Born in 1996 in Naberezhnye Chelny. In 2011 she finished Children's Music School No.1 (class by Elena Zyryanova) and entered the class of the same teacher in the College of Art in Naberezhnye Chelny. Since 2015 - she studies at the Saint-Petersburg Rimsky-Korsakov Conservatory (class of the Honored artist of Russia, Professor Olga Chernyadieva). 2012 – winner of the Grand Prix at the International Children and Youth Festival Competition "When We Are Together" (Naberezhnye Chelny). 2013 – winner of the IV International Competition for Young Performers of Academic and Folk Music “Art-Forum” (Kazan). 2013 – winner of the X Open All-Russian Yury Bolshiyanov Competition of Young Performers on Wind and Percussion Instruments (Krasnodar). 2013 – winner of the V International Contest “VIVA MUSIC” (Kazan). 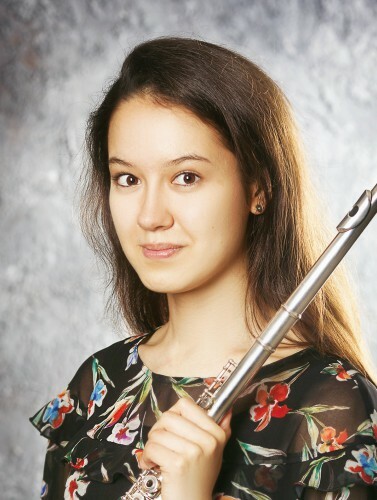 2014 – holder of the Grand Prix of the III Open All-Russian Mily Balakirev Competition of Young Performers on Wind and Percussion Instruments (Nizhny Novgorod). 2016 – II Prize of the XXI Tolyatti International Competition of Young Performers (Tolyatti). 2017 – winner of the II International competition for performers on wind and percussion "Northern Rhapsody" (Cherepovets). 2017 – winner of the Rimsky-Korsakov 4th International Competition of Wind Instrument Performers (Saint Petersburg). in 2015 she was awarded with a special state scholarship of the Republic of Tatarstan. She participated in master classes by Denis Lupachev, Joachim Schmitz, Wolfgang Wendel, and Olga Chernyadieva, Nikolay Popov, Felix Renggli, Vincent Lucas. Participant of the St.Petersburg Music House programs since 2014.